DIY projects are fun, personalized, and hopefully thrifty! One other box they should check is “quick”, because with phones buzzing and packed schedules, no one really has time for hours at the crafting table. So if your to-do list isn’t as blank as the one above, this is the perfect, 2-step craft for you. It’ll brighten up your work space in just minutes —I “pom”ise! That’s all there really is to it! So whether you have a knack for crafts, none at all, have a whole day on your hands, or only minutes to spare, this is the perfect way to get creative. What’s your favourite DIY project? There’s something about a succulent that just jazzes up a space! You can sneak a few on a kitchen cart, a bathroom shelf, or an office desk. But with fall at our doorstep, how do you make them fit in with the decor? Well, you can always opt for an earthy-toned pot and call it a day. Wipe off any excess soil and place them wherever you wish! Voila –succulent squashes to celebrate the season! Whether you use them as a centerpiece or as an accent in any room, you’ll fall for . And when the gourds are long gone, just re-pot the succulents in another planter. Valentine’s Day is finally here and love is in the air. Whether you’re saying “je t’aime” to your sweetheart or just showing your friends you care, a card is the perfect way to put those feelings on paper. Of course, you can dash to the store and pick up a printed card with pre-written texts and mass-made designs. But are those sentiments really your own? Be original this year and make a card from scratch. Plus, if you’re in a pinch for time and have special dinner plans tonight, this card should take no time to make. With lots of pretty pink layers, this is the most posh way to tell someone they make your heart flutter! Cut a 12×18 cm piece of the wrapping paper and fold it in half. Draw half of a heart on the side, and cut along the outline. When you unfold, you should have a full heart. Do the same with the tissue paper, but make the dimensions slightly larger: 12.5×18.5 cm. Glue layer by layer only at the “seam” (middle or along the fold line) of the heart onto the blank card. Let dry and ruffle up layers once set, to give volume or “flutter”. That’s all there is to it –three steps and you’re done! PS: Berkeley, my cat, decided to crash the photo-op and become part of the picture! Thought it would make a great outtake. Make your mark with these quick to craft eraser stamps! 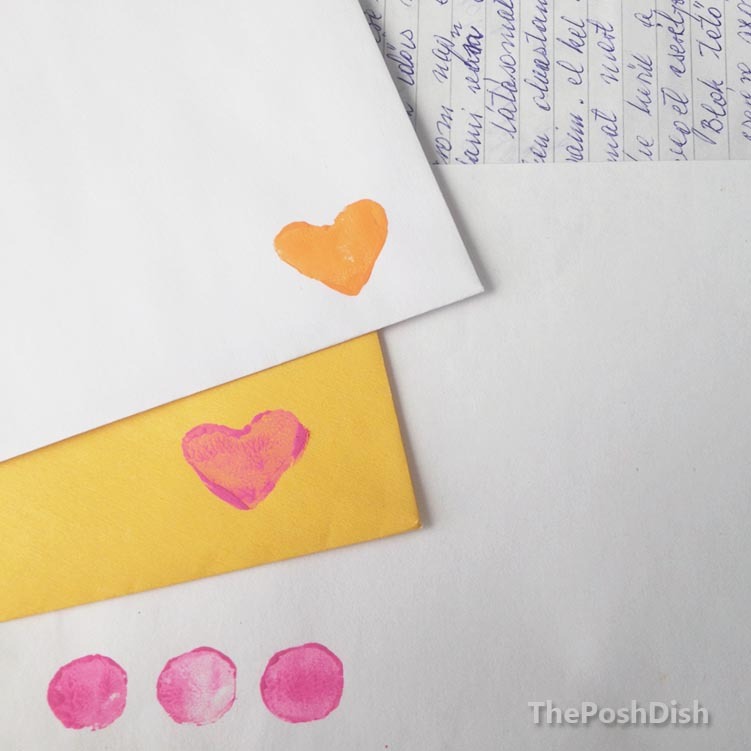 They’re a great (and cheap) way to personalize cards, plain wrapping paper, and envelopes. Pen pals, far away lovers, and even an old friend will be thrilled when your letters arrive in the mail. YES, letters. While emailing and Facebook are fantastic, I’m still a fan of putting pen –and stamp, to paper. Just don’t try them on a credit card bill –while anyone can appreciate a good effort, a stamp won’t save you. Keep scrollin’ to see how it’s done! 3. With a pen or pencil, draw the outline of any shape you’d like your stamp to be. Carefully cut around the outline with a utility knife. 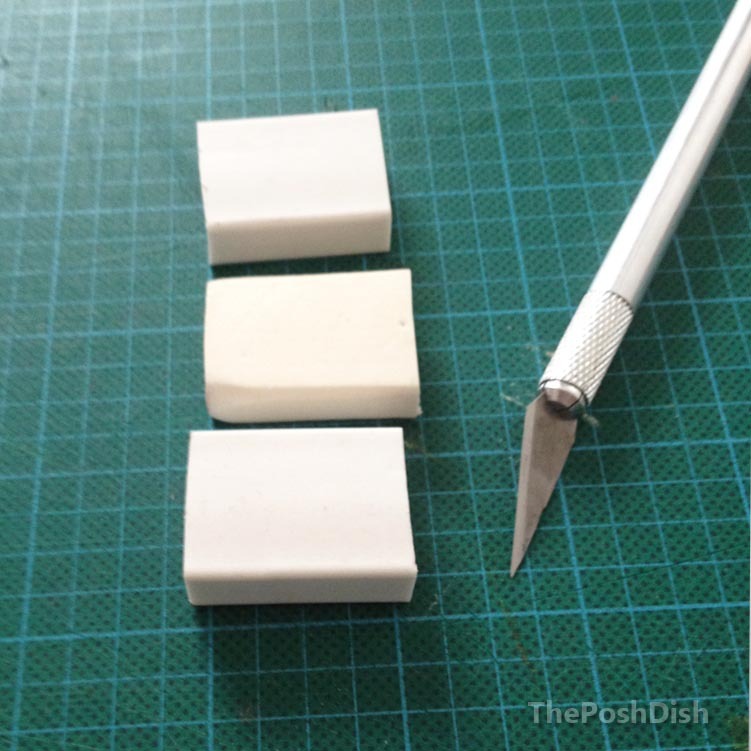 Chip away the eraser around it in order to be left with a relief of your shape. 4. Cover the surface in acrylic paint of your choice or use a stamp blotter, and get ready, set, stamp!